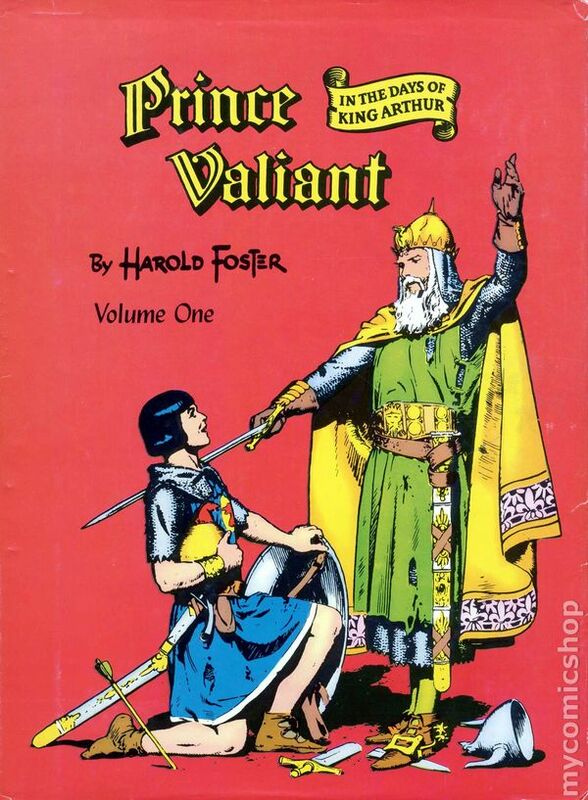 I remember my first sighting of Harold Foster's Prince Valiant. 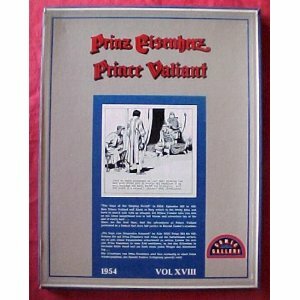 It was on the back of James Warren's Creepy magazine wherein amongst the various goodies that Warren's Captain Company were offering was seven volumes of Prince Valiant published by Hastings House. When a few months later I came across copies of the books in London's newly opened pioneering independent comic and fantasy shop Dark They Were and Golden Eyed, I was indeed impressed with the production values of the books which charted Valiant's adventures from his boyhood to ascendancy as fully fledged Prince, married to the lovely Aleta, who of course is a Princess - of the Misty Isles - no less. The only thing wrong with these books was that they were presented in the guise of illustrated texts, rather than comic strips. So what you were looking at, beautiful and captivating as the images were, was a bastardized version of Foster's ground breaking strip - you were still not actually looking at the pages as Foster intended, rather you were looking at the pages that Hastings House thought would be more likely to gain the approval of librarians and teachers. The books had been in print since the 1950s in an era where even comics as respectable as Foster's Prince Valiant would have been regarded as unworthy of life between hard covers, so the imperative was evidently that Prince Valiant had to look like a proper illustrated book. There was by the time (1972) that I was ferreting around in DTWAGE's new arrivals shelve, other incarnations of Foster's masterpiece, in the form of some French softback albums, but the repro on these was just appalling and Woody Gelman's recently published Nostalgia Press reprints of Valiant's early years were not much better, albeit both these publications being in color, whereas the Hastings House books were in black and white. Something else was definitely required and it was sometime in the late 1970's that an Austrian publisher by name of Heinz Pollischansky published two handsome black and white folios of Prinz Eisenherz. 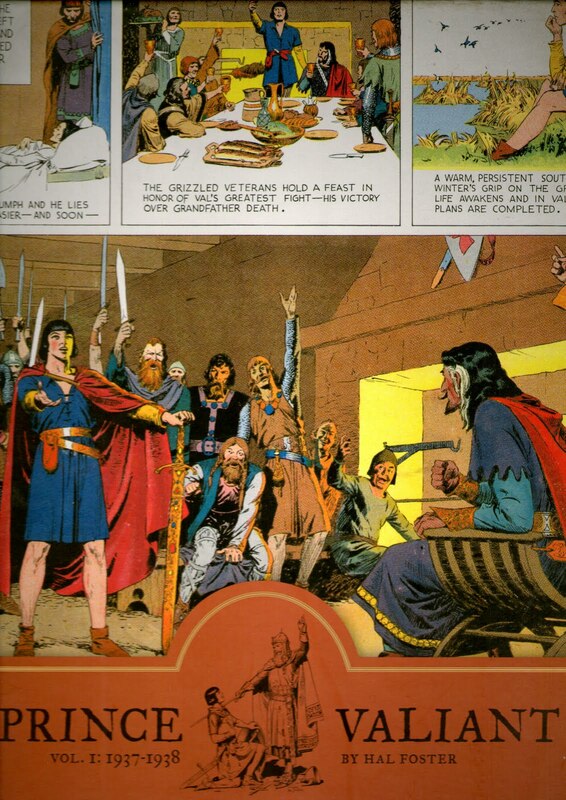 The pages from each strip were housed in a smart looking box, with English text on the front pages and German on a smaller version printed on the reverse of each individual plate. The only slight problem was that the years in question 1954 and 1955 were not quite as captivating as the early years of the strips run, as by now Prince Valiant having plighed his troth with the lovely Aleta was turning into a medieval Dagwood to Aleta's Blondie. In the process much of the dark fantasy which had so characterized the early years of the strip had been lost. More volumes followed in book format but frustratingly they continued on the run from the 1950's, although tantalisingly the first two years of the strips run were also included. his soaring costs down each volume was paperbound dictated that even reading the thing was an event that required a certain amount of pre-planning. However the thing that eventually saw this project run out of steam was the cost of the color separations. 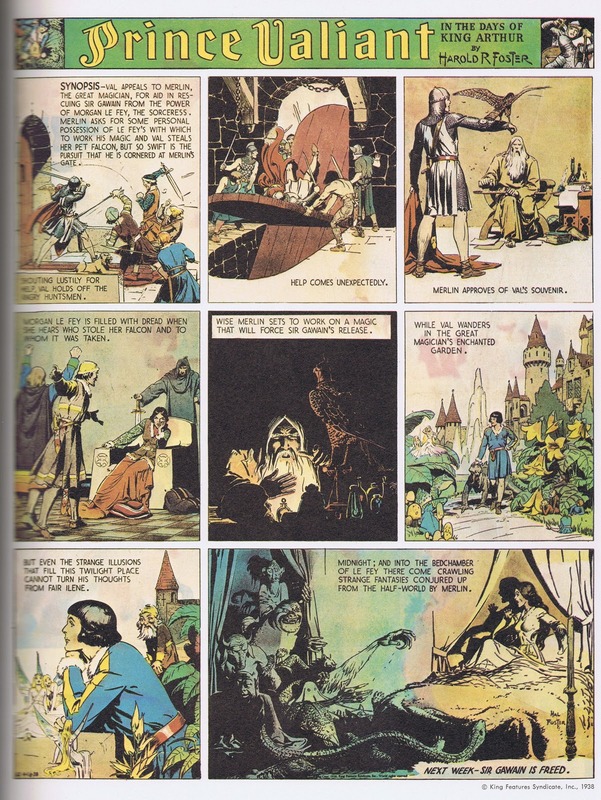 Each volume of Norwood's Manuscript Press Edition Prince Valiant's was sourced from optimal quality black and white artwork and then using the pages of the original Sunday Comics as guides, new color separations were created. The cost of this part of the procedure, coupled with his already soaring printing costs and the need to sell enough of each highly priced edition to justify producing a new volume, dragged out the project to the point that only the most dedicated made it to volume three. A very limited edition of 26 copies was produced which contained all three volumes bound together as a way of writing a finis to the project. Meanwhile an up and coming publisher by name of Fantagraphics Books was publishing the whole series of Prince Valiant in a much more affordable soft cover format. However as regards this reviewer at least I would have much rather spent a fortune on Norwood's epic enterprise than ploughed money into acquiring a set of books that didn't look that much better than a lot of other European editions that were also in print. 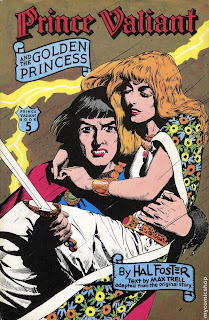 So for years my Manuscript editions remained my arbiter of what should be achieved with a reprint of Prince Valiant. That was until a year ago when I received a phone call from my main man in the comics 'hood Mr Geoff West, Chief Svengali and Master of the Universe otherwise known as The Book Palace. 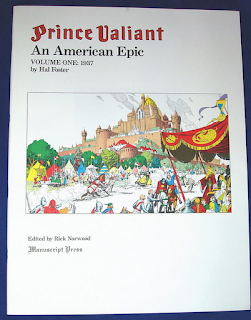 In the course of said call he mentioned that he had just taken a delivery of the new edition of Fantagraphics Prince Valiant. "Yes Geoff, but is it as good as the Manuscript Press editions"? ""No, it's better, a LOT better, wait until you see it!" Check out this link for more information. Volume four covering the years 1943-1944 has just been published. I am also including a sample from Valiant's first meeting with Morgana Le Fey to show a bit more of what Fantagraphics have achieved with this series. The first sample is from The Smithsonian Collection of Newspaper Strips and as you can see was shot from a Sunday Comics section with the curse of all comic restorers (I should know after working on The Wulf the Briton project) see through from the strip printed on the reverse side showing through loud and clear. 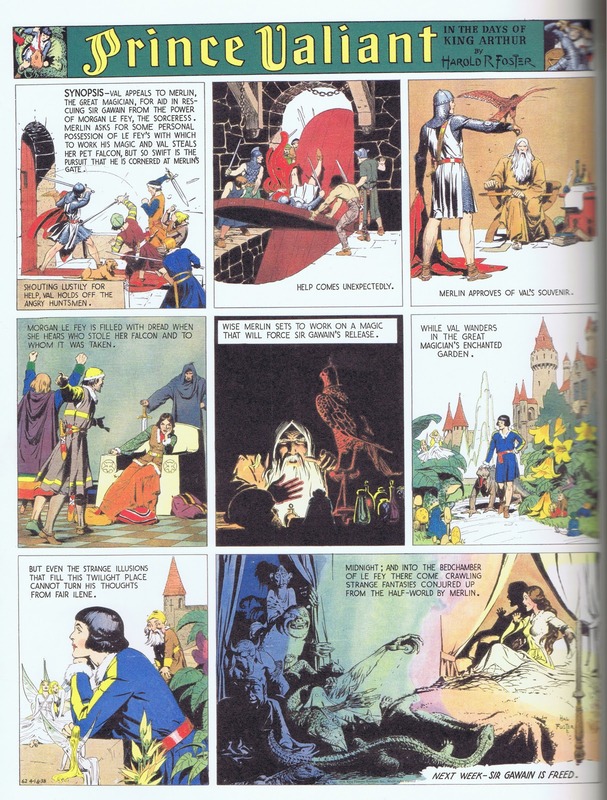 Whereas the Fantagraphics page is scanned from Hal Foster's collection of proofs and what a difference this makes! 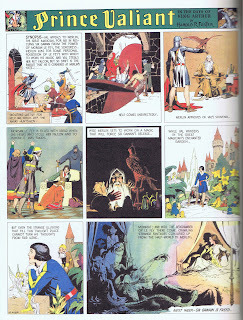 For lovers of Foster's unadulterated black and white line work it's also worth mentioning a fabulous Portugese edition of Prince Valiant by publisher Manuel Caldas. Only the first year 1937 has been published in English, but many more years are available in Spanish. Again check out this link for more information and the page above again shows the high fidelity of this edition's repro in comparison to previous efforts. 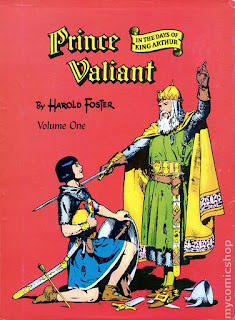 Certainly the best edition of Hal Foster's Prince Valiant is the portuguese/spanish by Manuel Caldas in glorious black and white. 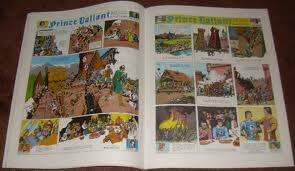 But the edition in color by Fantagraphics is quite good, specially the last volume (4th). I'm collecting now three editions, two in spanish (b/w and color) and one in english (color). One friend of mine has 25! 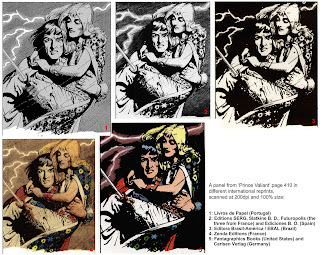 Yes Andoni, I must admit Manuel's edition of Prince Valiant is easily the best black and white edition and because it's in black and white it is so much closer to Foster's original artwork. The first volume has a section of Foster artwork reproduced the same size as the original and that is just incredible. ... and find some more shelf space! There are 8 volumes (1937-1938, 1939-1940, 1941-1942, 1943-1944, 1945-1946, 1947-1948, 1949-1950) in Portuguese/Spanish. There are two more on the way (1951-1952, 1953-1954). The reproduction of the Foster's work is amazing. You can take a look at the page of Manuel Caldas (www.manuelcaldas.com). Fantagraphics is doing better with each volume, being the last one the better. And of course, my warmest regards for your edition of Ron Embleton's Wulf the Briton. Another British classic on the horizon? Frank Bellamy? Frank Hampson? Many thanks for your kind words Andoni regarding Wulf and yes we might have some good news regarding another epic UK comic produced by one of the greats you have mentioned. More on that front in the not too distant future. 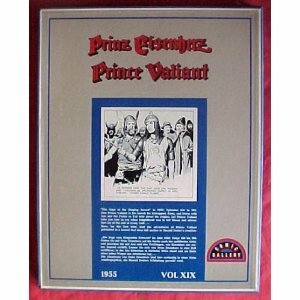 Many thanks also for your help listing Manuel's superb Prince Valiants. What happened to "The Three Musketeers" by Castillo? 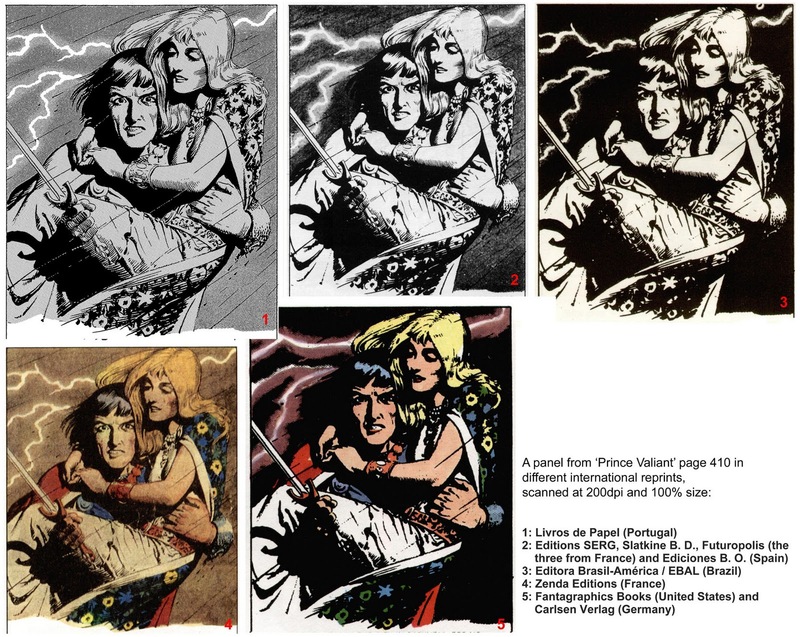 Very important: the “Prince Valiant” Portuguese Edition is IN ENGLISH and includes the first 2 (two) years. Manuel Caldas told me that no further volumes were published because Diamond, although putting the book in their catalog, refused to distribute it through bookstores the traditional way, claiming it was a book too large and a comic strip too old. And also told me that some 2 years ago he was contacted by Mr. Geoff West, from Book Palace, who was interested in publishing other volumes. They made conversations, but at a certain point Mr. Geoff never again said nothing on the project. Hi Alfredo, in answer to your question "The Three Musketeers" project was halted with the book ready to go to press. The problem was that DC who are owned by Time Warner bought the rights to IPC's back catalogue and as there was talk of another Musketeers film the parent company refused to grant permission for the book to be published. I can't speak for Geoff regarding publishing Manuel's book in English - so sorry I cannot shed any light on Ruben's query.